30037448 - RS232 Interface kit to suit the following OHAUS digital scale models:OHAUS Ranger 3000 bench scales OHAUS Ranger Count 3000 counting scales OHAUS Valor 7000 food portion scales .. Optional Ethernet Interface Kit to suit all OHAUS Ranger 3000, Ranger Count 3000 and Valor 7000 scales. ..
OHAUS USB Interface Kit to suit all Ranger 3000, Ranger Count 3000 and Valor 7000 scales. ..
OHAUS second scale interface kit to suit Ranger Count 3000 counting scalesConnect a second scale platform to your existing counting scale to cover all your counting requirements, both b.. The OHAUS Ethernet Interface Kit, P/No. 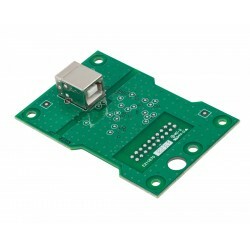 30268986, adds Ethernet connectivity to all OHAUS Scout SJX, SKX, SPX, STX precision scales. Download user guide ..